For the last few seasons I have been installing these Hunter Solar Sync ET (evapotranspiration) Weater stations. They have been a real water saving benefit to the home owner, small business, and commercial properties. Calculating the onsite weather conditions, then adjusting the water delivery requirements to give the optimum watering levels for the healthy nourishment and plants growth. 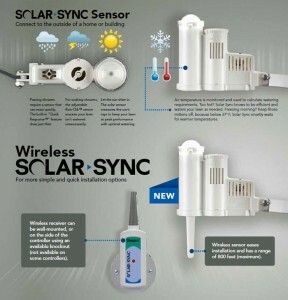 Winter it automatically drops the watering percentage without you ever having to touch the controler. The same is then said for Spring and Summer the controller then uses its original programmed run time and adjusts to Solar Sync’s seasonal adjustment value to modify the actual irrigation run time for that day. Then on the extreme days we get here in Perth this system establishes the required water delivery for your plants to thrive. This unit also integrates the sought after rain sensor that provides quick response in shutting down your irrigation system during rain and/or freezing conditions. 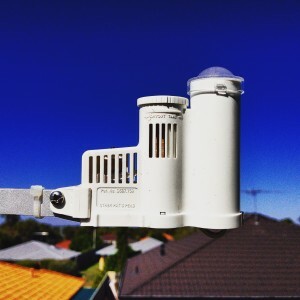 The Hunter Solar Sync maktet leading domestic ET waterwise reticulation sensor really stands out above other domestic and small commercial units. Giving you the best water savings out comes for your home and landscaped areas. Using this weather station along with a well designed reticulation system you can save about 30% if not more of your annual watering requirements. This obviously saves on your water bills, where you can use those dollars else where. I highly recommend these units in conjunction with the Hunter X-Core control box, they are a great pair for the Perth Reticulation climate.